Aston Martin; Less pretentious than a Ferrari, with more character than a Porsche and forever mentioned in the same sentence as a certain charismatic English spy. If you ask me what comes to mind when the name Aston Martin is mentioned I’d have to say heat, sweat and the clamour a thousand machine guns. A strange response agreed, but one that is warranted after sampling Aston Martin’s GT4 racer on a summer’s day at Abu Dhabi’s Yas Marina Circuit. Aston’s GT4 spec Vantage has clocked up close to 100 units since it was conceived in 2008 and competes in race series everywhere from Australia to Brazil. Engine and drivetrain remain fairly stock apart from addition of a beefier clutch and lighter flywheel in the automated manual transmission and a free flowing exhaust has also been added to the 4.7 litre V8. Aston Martin Racing who prepare the cars have managed to shed almost 300kg from the weight despite adding an FIA-approved roll cage,115 litre bladder fuel tank, brakes the size of small planets and Cosworth data logging systems. I will start this off by telling you I don’t cope well with heat and anyone who knows me will attest to that. So when I jumped into the roll caged, race seated cabin on that 38 degree celcius day I was pleasantly surprised by the inclusion of air conditioning. I was less than impressed when the air conditioning ceased to live after the anti clockwise sweeping tacho needle passed 4000rpm. However the noise that echoed around the stripped out cabin made up for the stifling heat. I can only describe it as sounding like a combination of NASCAR V8 and the previously mentioned machine guns. The noise inflicted the first beating my senses would take that day and one that was only bettered when the slicks mounted to the 18”x10” magnesium wheels warmed up and provided the little Aston’ with huge levels of grip. The 10” wide slicks not only allowed the Vantage to carry corner speed that would make a road car blush, but they also let the full power of four, four piston monoblock callipers squeezing down on vast two-piece discs be realised. There’s nothing that could have prepared me for the feeling of the huge brakes teamed with giant slicks or the mechanical completeness that a professionally prepared race car like the Vantage exudes. 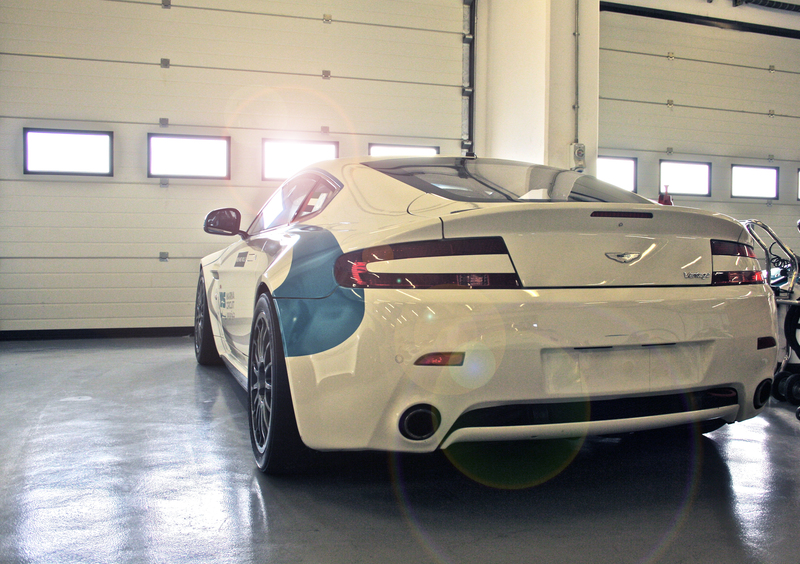 After sampling the entry level Aston race car the best way to describe it would be, like a duck treading water. On the surface everything looks calm and composed (it doesn’t sound it) but under the surface the car’s ABS, traction and stability control are working on keeping the un-experienced joy rider that was me from turning a beautifully hand crafted race car into a shattered pile of carbon fibre. The best thing about the GT4 Vantage? Someone was silly enough to let me drive it. ← Revs, front and centre.